With my not-so-subtle attempt at clever serving pieces, you can probably guess what movie we went to see. 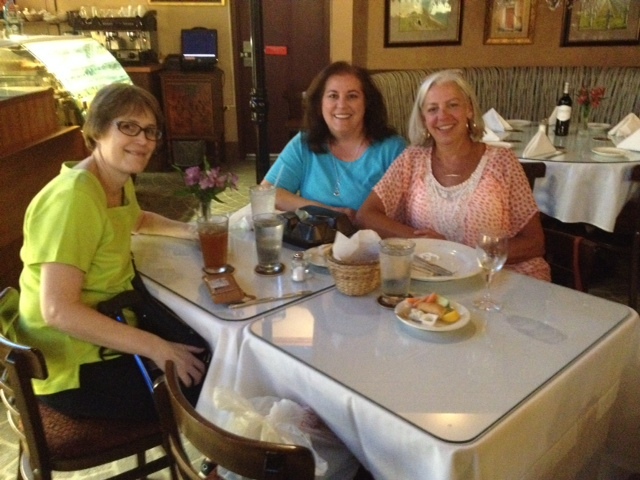 I first went to the theater on Friday to see Jurassic World with the two friends whom I have known the longest, Terri and Nancy. We met in the third grade and have been the best of friends ever since. 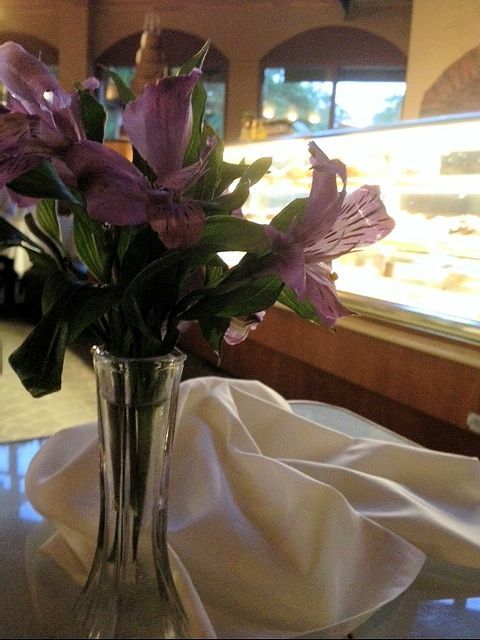 We dined at City Cafe. 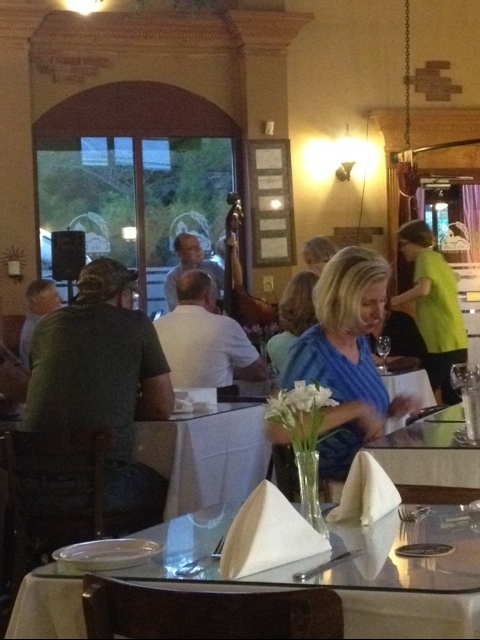 They have great food, delicious desserts, and beautiful live music. It is a perfect combo when you add friends into the mix. Then, on Saturday my mom wanted to see Jurassic World so I went with her. THEN, on Sunday we decided to go back to see it again in 3D. Needless to say, I liked the movie. In general, I guess I’ve always liked dinosaurs. 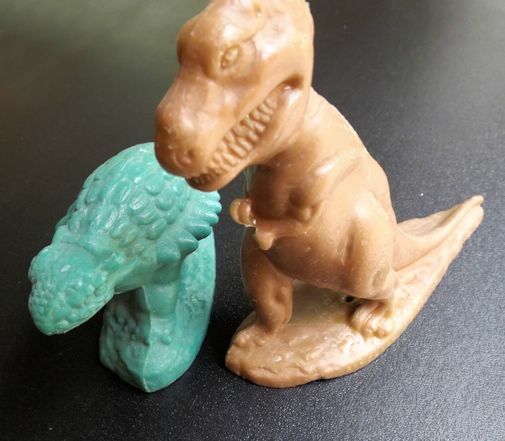 I still have my Sinclair Dinoland extruded wax dinosaurs from the 1960’s. Remember these? 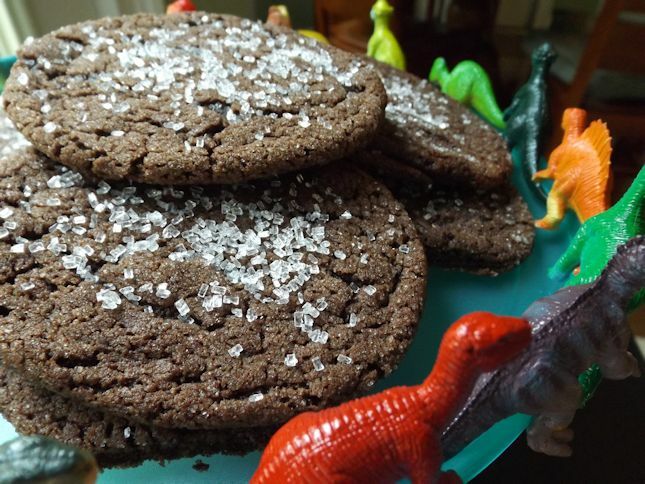 I made some cookies that were supposed to be Lava-ish but mine are too flat so I’m calling them dinosaur eggs. They tasted good as they were so I didn’t want to try to figure out how to make them gush like lava in the middle. I’ll save that for another day because we are busy this summer! Next up is Ant-Man! Cream together butter, shortening, and sugar. Add eggs and mix well. Add vanilla. 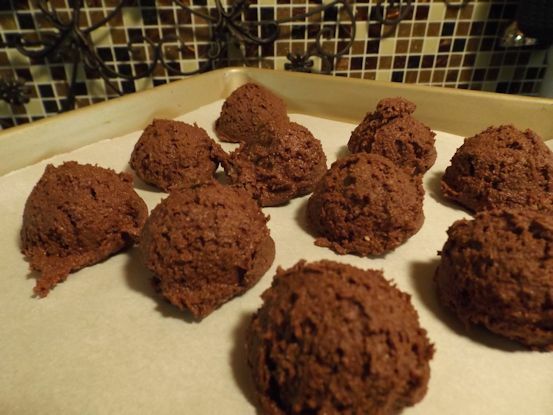 In a separate bowl, mix together flour, salt, baking soda, and cocoa powder. Slowly add dry ingredients to egg mixture until well blended. Shape dough by rounded tablespoonfuls onto a cookie sheet and refrigerate for an hour. 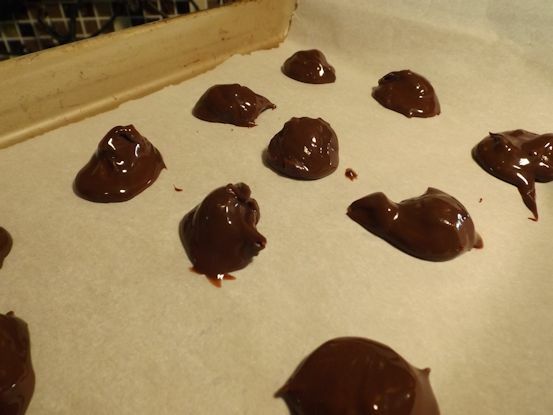 Using a melon-baller, scoop the fudge sauce onto parchment paper on a cookie sheet and freeze. Preheat the oven to 400 degrees. Take a piece of cookie dough and flatten it slightly. Place a piece of fudge sauce in the middle of the cookie dough and press the dough around it. Roll the dough in sugar. Bake at 400 degrees for 6-8 minutes on a parchment lined cookie sheet. Allow to cool 1-2 minutes on the cookie sheet. Remove to a wire rack and continue to cool. Makes about 30 cookies. 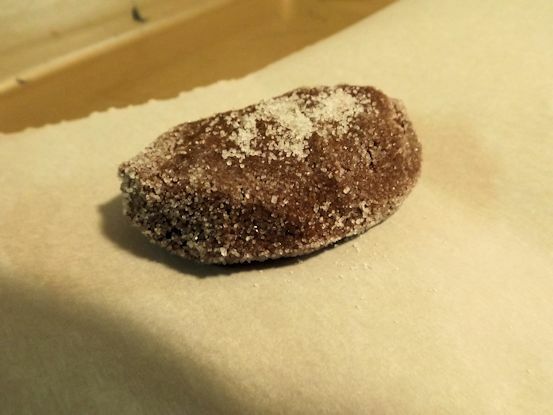 Encase the fudge sauce ball into the dough and roll in sugar. Eat them up. 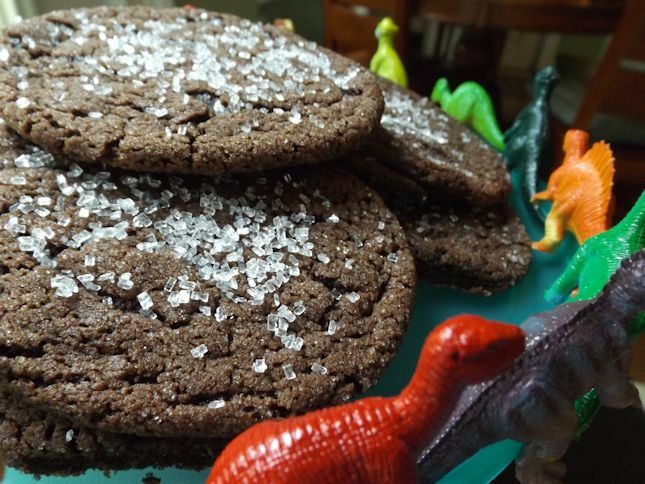 The fudge sauce stays soft so it seems like you are eating almost done cookies without having the be worried about uncooked eggs. Very tasty especially when still warm. So, you liked the movie???? Looked like a fun time.